The tide is rising. Pretty high too. The fishing was not too good on Tuesday. The rising water fouled up the consistency we had been enjoying until this point on Tuesday. More water coming today, as mentioned above. The Dearborn is at 617 Tuesday nite and rising. Little Prickly Pear is 344 cfs and rising. Both of these feeders are 3 times normal flows. a rain and sow event will push them up. Unless it gets cold like John mention on Tuesday. The westside of the divide is cold and snowing. That could freeze up and rectify the rising tides. Until then the mud is not too bad out of either tributary. The Dearborn is glacial green plus one whack of brown-ness. LPP is brown-is with a hint of frosty green. The Mo is green with good visibility. Below the Dearborn Tuesday still showed 36″ of viz. Certainly enough to fish through. Swinging was tough on Tuesday. Did get some fish to hand. Few and far between as the water does upset those trout out there. They are finding ew homes and hang outs. The trouts. The fish never appreciate that kind of water movement actions. Dropping? Not as tumultuous for the fishy’s. Think about your water type this coming weekend and week f you fish the Mighty Mo. The fish will not move into that good looking bank water now either. Fish the slower deep tank-her type of water. Snd stay in it. Yes there will be an occasional fish feeding, playing, enjoying a bit of early summer water, but not the masses. no, the majority of them are in slow tangolike inside bends. Or fish the other stuff. Why not. Guide Trips out daily. Shuttles. Your Montana Trout Spey HQ. Rental boats. Demo Rods galore. Try out a new rod for yourself this spring. 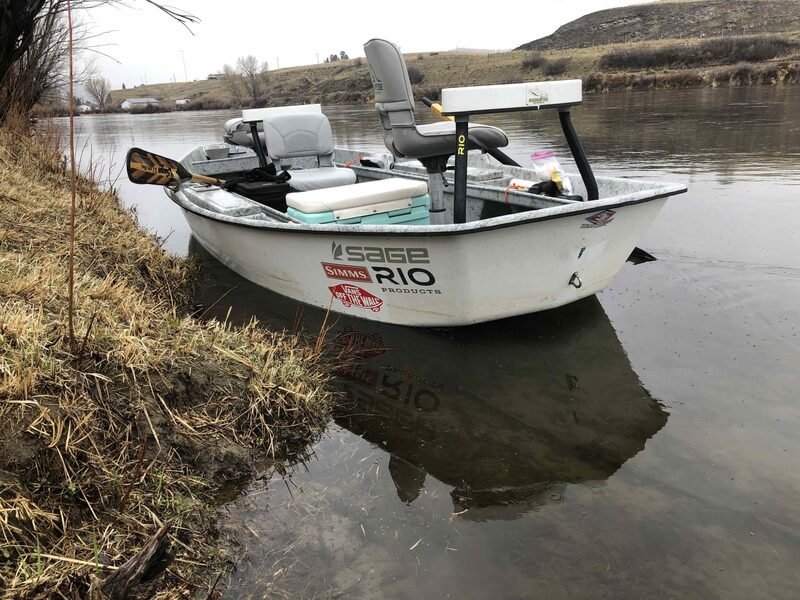 Fly lines that you need to make your 2019 fly fishing season a success. Sun gear. Raingear. Gloves. Handwarmers. Flies like no other fly shops. Just way more and FRESH. 7wt says so. New patterns yearly. Just ask our crack fly shop staff for help. We got yer back. The friendly fly shop in downtown Craig Montana open daily 8-7. Ahh, sounds like spring in the Rockies!